Abhishekam for SriGaruda, SriVinayaka, SriAanjaneya, SriSudharshana, SriLakshmiNarasimha, SriDurgaParameshwari, SriShiva and Navagrahas is performed on day to day basis. Special Poojas are performed to Lord Garuda- The carrier of Supreme Lord SriPadmanabha on monthly basis and special Rakshay called Garuda Rakshay is given to devotees. There have been tons and tons of devotees who have benefitted because of this. 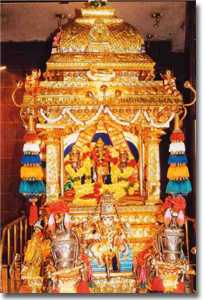 Every month, on the Thiruvonnam Nakshathram day, Rathothsavam for SriPadmanabha Swamy takes place. 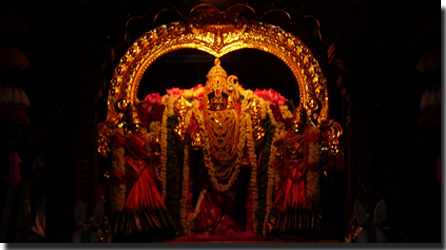 On every Pournami day, Abhishekam for SriPadmanabha Moolavar and a procession of SriPadmanabha Utsavar takes place. For every Pradhosham day, special Poojas for Lord Shiva and a procession of Pradhosha Moorthy takes place. Sathyanarayana Pooja is also performed in the temple. Special Poojas including Moolavar Thirumanjanam/Abhishekam takes place on the Vishnupathi Punya Kalam that occurs once in 3 months. Narayaneeyam and other important texts are recited by devotees on specific days. Sai Bhajan also takes place frequently. Srimad Bhagavadha Sapthaha Yagnam is also an yearly event. Special Poojas and celebrations are performed on the Vishu day for SriPadmanabha. Special Pooja for Mother Durga Parameshwari is performed on important days like Thai velli, Aadi velli, etc. On the request of donors, special Homams, Kalyana Utsavam and Swarna Rathothsavam are also organized. Kuthuvillaku Pooja is performed for Mother Durga Parameshwari on important days. 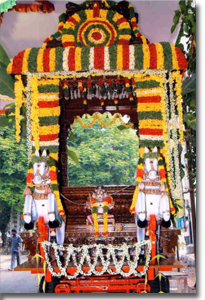 On the 4th Saturday of the month Purattaasi, Garudasevay for SriPadmanabha takes place. The Anantha Vratha day, which is a special Vratha for SriPadmanabha, occurs once a year. On this day, special Poojas are carried out and people from various places gather to take up this powerful Anantha Vratha. Dhanur Maasa-The month of purity and divinity, is a period dedicated for Poojas and Namasankeerthanam. Devotees sing and chant the Thiruppavai, Thiruvempavai and other Bhajans for SriPadmanabhaSwamy early in the morning. Special music concerts and discourses are organized during this month. Every New Year (Jan1), Acharya from SriSharadhaLakshmi Narasimha Peetam, Hariharapura spreads his grace in the temple and blesses all devotees with happy new years ahead. SriVinayaka Chathurthi, SriKrishna Jayanthi, SriRamanavami, SriNarasimha Jayanthi, Maha Shivarathri, Shankatahara Chathurthi, Onnam, Annabhishekam, SriHanumath Jayanthi and other important festivals are also celebrated in a grand scale.